Last week, the Victorian chapter of the Australian Institute of Architects hosted its second annual members forum. Chapter Councillors Amy Muir and Stuart Harrison chaired a panel that fielded questions “on the role and direction of the profession, with a focus on media and engagement”. Why should I be a member of the Australian Institute of Architects? 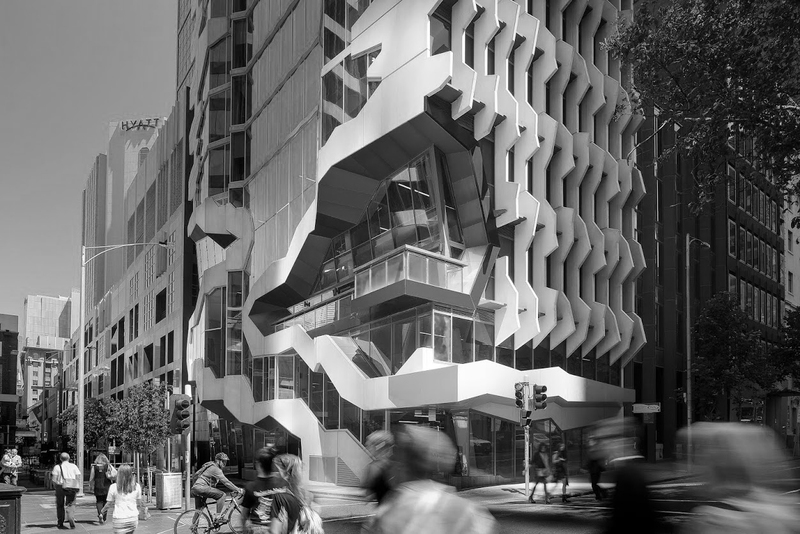 What is the Australian Institute of Architects? We need to band together as a profession. The AIA is changing, it’s no longer a stuffy old-boys club. The AIA is good at articulating ambition for the profession. The AIA allows me to participate in my profession. The AIA gives the profession a strong, unified voice. These are inspiring answers. In particular, McGuaran, Bertram and Malatt’s comments describe an altruistic institution, one that both leads and supports the architecture profession, encourages us to be the best we can be. And they infer a strong professional unity, a preparedness to be generous with our time and learning. But they are unfortunately answers that preach to the choir. I am drawn to the vision outlined by the panellists in part because their comments articulate thoughts already loosely formed in my own mind. I am already a member of the AIA, already want it to be strong. Does the rest of the profession agree with me? Like a political party, a professional body is only as strong as the saturation of its membership. Anecdotally, the AIA has in the past attracted membership from 75% of registered architects. Finding out whether this is still the case is, disturbingly, easier said than done. No one really collects the numbers. The architects’ registration boards in each state and territory keep a record of how many registered architects there are, but there is some overlap that introduces an unknown margin of error. The AIA compounds this murkiness by not offering a membership category that strictly aligns with this segment of the population. The bottom line is that only 45% of registered architects are members of the AIA. It is abundantly clear that a very large chunk of the architecture profession isn’t convinced by the AIA’s value proposition. For around 7,000 registered architects across Australia, my question, Why should I be a member of the AIA? has no satisfying answer. This is a deeply shocking situation. Financially, I am sure such poor saturation is hurting the AIA’s annual revenue. It also means that when the AIA speaks with its “strong, unified voice”, it cannot even say it does so on behalf of the majority of Australian architects. So why aren’t more architects members? I am sure the AIA has undertaken significant investigations to answer this question, indeed it has come up in discussion at numerous recent AIA events I have attended. But so far, nothing I’ve heard has been convincing, or has been convincing but for some unknown reason isn’t working. I think the problem has arisen in part because the AIA is not successful at communicating with the profession. I consider myself a conscientious reader of the various media content the AIA distributes, yet I miss important things all the time. But to blame the disenfranchisement of the profession on poor communication is to scramble for an expedient scapegoat. The problem is systemic and, to return to my original questions at the members forum, has a lot to do with what the AIA is. I’m hardly in a position to say what the AIA should and shouldn’t be, but as I went to bed last night, chewing the content of this article over in my mind, I realised something important that might shed some light. Our local toy library is a not-for-profit, community-owned resource for toys. For an annual membership fee of $80, toys from the library’s collection are available to borrow for two weeks at a time at no extra cost. The value proposition here is clear: we have access to a large selection of toys; are able to keep our children entertained by regularly exchanging the toys we take home; and never clutter up the corners of our house. All for considerably less than it would cost us to actually purchase the toys. The toy library provides other, more altruistic values too: by borrowing instead of purchasing, we reduce the environmental impact of our growing children; and by participating in the toy library, we contribute to the critical mass of families required to make it feasible and in turn available for families less fortunate than us. So the value proposition of our local toy library succeeds for both selfish and altruistic interests. Would we still pay our $80 membership if it were only accessible to disadvantaged families? Possibly, but then it would be a charity, not an important part of our daily lives. The toy library would no longer help us, we would be helping others. This is not to give the impression that self-interest is somehow the villain in this equation, quite the opposite. Self-interest has the power to take a truly worthwhile cause and make it accessible and relevant. The best, most meaningful organisations capture both values, allow each to reinforce the other. Does the AIA capture both self-interest and altruism? But by my reckoning, it doesn’t. Many of the above mentioned services are non-essential, that is, not really needed for the daily business of being an architect. Many aren’t even included in the standard membership available to registered architects. And based on discussions with colleagues who work in large practices that do enjoy access, they either don’t know about or don’t use them. Really, we need look no further than the brutal but honest numbers: if architects thought the AIA could help them in their daily lives, more would be members. I am a member because McGuaran, Bertram and Malatt put into words what I was already thinking. I am passionate about architecture and the built environment. I believe in the value of participating in our profession, of giving it a strong voice. I attend countless AIA-sponsored conferences, lectures, seminars and forums, and then I write about them. I follow the AIA on Twitter and eagerly read through my email alerts each week. The AIA is the architecture profession’s peak body and, I believe, should have the support of all architects. But I am not all architects. In particular, I am not my 7,000 colleagues who aren’t members. I speculate heavily here, but perhaps many of them think of architecture like any other job. They work from 9 until 5 and then go home to invest their energy into their families and hobbies. Perhaps some can’t afford it, or think they can’t. Perhaps others don’t like the AIA, so choose not to join in protest. If the AIA is to achieve its own self-declared mission, to be relevant, meaningful, important, essential and influential, then it has to engage with the disenfranchised, disinterested and apathetic. It needs to address self-interest first and foremost, needs to ensure its value proposition is so alluring that every architect sees no choice but to join. In the short term, the AIA will benefit from bolstered membership revenue. In the medium term, the profession will benefit from a stronger peak body that offers better and more tailored services. And in the long term, with more practitioners exposed to the daily value offered by the AIA, the built environment will benefit from the realisation of the AIA’s core, truly altruistic goals. Australian Institute of Architects; 2015 Victorian Chapter Members’ Forum event description; accessed 9th May 2015. 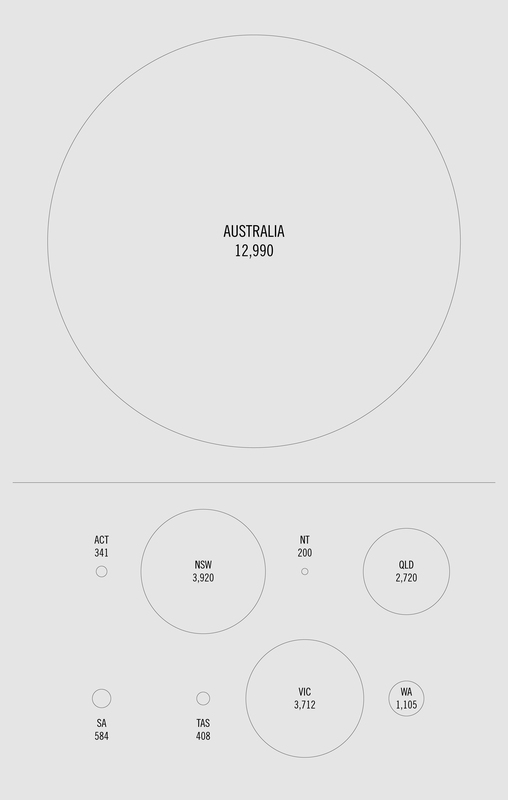 For example, in Queensland there are 2,720 registered architects. 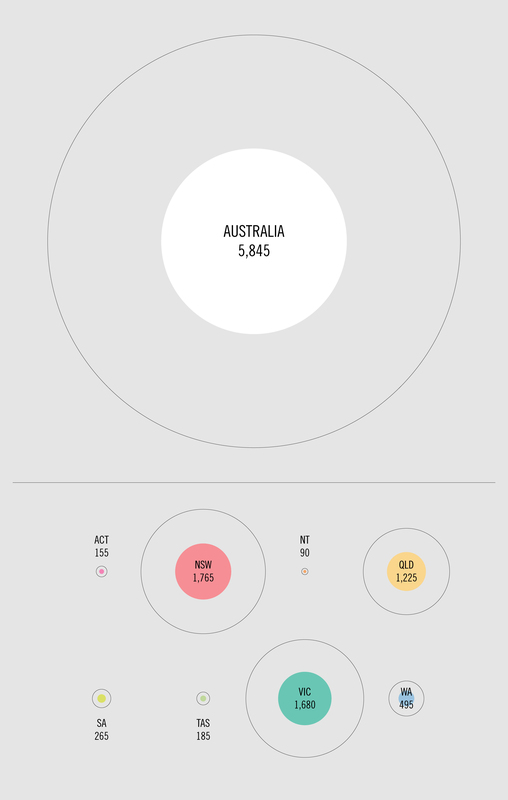 A further 374 registered architects reside outside Queensland (hence possess dual registration). An unknown proportion of these are registered in multiple or even all states and territories. To quote Michael Bloomberg, “In God we trust, everyone else bring data.” Knowing how many student, graduate and registered architects there are across Australia, and how many are members of the AIA, is an essential and historically absent piece of data. My research for this article has been very shallow, relying on Victorian AIA statistics to extrapolate the other states and territories. If you would like to fund a more in-depth study, please get in touch. Based on current membership fees of $916 per person, the 55% of registered architects who aren’t members cost the AIA around $6,500,000 a year in lost fees. This number does not take into account other membership categories e.g. students, graduates and academics. For instance, one of the most poorly represented groups within the AIA are architecture students. This is despite student membership costing a measly $85 per year, just $3 more than the subscription to Architecture Australia that comes with membership. And despite the AIA recently making membership free to all first year architecture students across Australia. Some are included within the recently established A+ member category, which is slightly more expensive for sole-practitioners but cheaper for larger practices. Others, like awards and CPD events, are available on a user-pays basis. 41X, sourced from Knowledge to Scale. Modified from the original, copyright belongs to John Gollings. Number of registered architects, author’s own image. Number of AIA members, author’s own image. Toys Paradise, sourced from Moriyu Gallery. 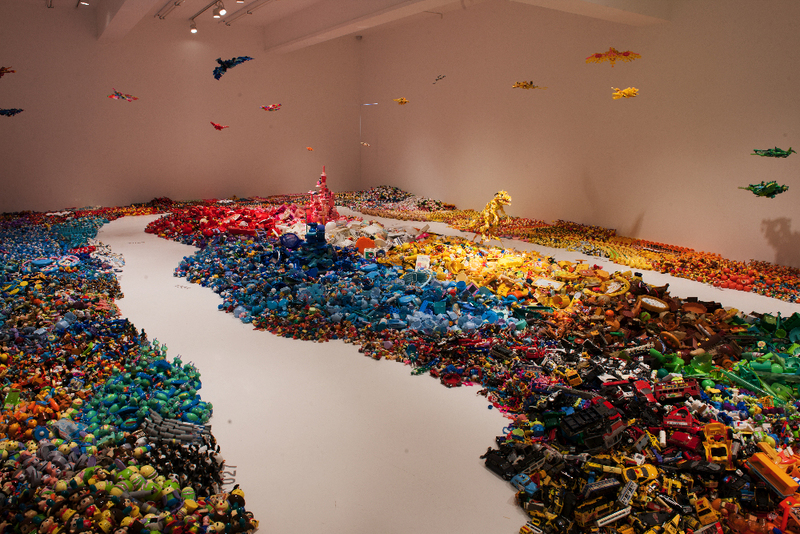 Installation by Hiroshi Fuji at 3331 Arts Chiyoda, 2010. Warwick – another excellent piece of writing. I really enjoy your (collective) posts. They are always informative and entertaining. I will let you in on my thoughts on this – I am not a member of the AIA, and haven’t been for a long time. I see the value in all the AIA does – but for sole practitioners the cost out way this benefit. Firstly, my perception, and that shared by others I speak to, is that the AIA is too inward looking. The AIA promotion of the architectural profession relies almost entirely on the Awards process. These awards are dominated by large, expensive projects and by largely established practices*. The do not resonate with the general public and receive very little coverage outside the architectural press. This is boarderline criminal when the state of architecture is already viewed by the large majority as a pursuit of the elite. The AIA does nothing to dissuade people from this notion, and the awards almost reinforce it. In other press and matters surrounding architecture, building and urban design / planning the AIA is silent (or worse, ignored). You are more likely to hear a comment from an estate agent about housing than a AIA spokesperson. In a nation obsessed with renovation lifestyle programs, the AIA should be on every news break discussing everything from public infrastructure works to cost of renovating. Instead our peak body ceeds this discussion space to others. This is endlessly frustrating. The second reason is self interest. The overwhelming number of architects are solo-practitioners. The memberships fees ($1150)n for single person firms starting up are large enough to be a disencitve by itself, but adding insult to injury in this, the AIA doesn’t offer a huge amount of support to these practices – no more than cheaper alternatives like Architeam – but almost competes against them through ArchiCentre. It is a while since I have reviewed my membership status – and accept to a degree that some there maybe changes to address the above issues. But the institute hasn’t reached out to get in touch to sell itself either – my email is freely available on the register. In short – I don’t feel the AIA is the best representation of me, or my view or architecture, and it doesn’t really seem to show the concern that it should about the profession that extends beyond a fairly narrow sector. I realise the AIA can’t be everything to everyone. but for a large number of us, it is irrelevant. To the public, it is invisible. * – Yes I know small practices get awards – but it is overwhelming larger firms that get repeat awards. It doesn’t really benefit us all. Warwick, excellent work as per usual. A key issue I believe is that many people do not believe that they get ‘value’ for their money… akin to Paul’s comments above. A common complaint is that architects want better representation and increased respect across all levels of government and the community, but they fail to remember that the majority of advocacy and external facing activities undertaken by the Institute are done so on a voluntary basis by committed (often over-committed) members. Whilst voluntary work and knowledge is incredibly important, if the dollars we paid as members were used to pay for dedicated staff at the Institute whose job it was to advocate, talk with governments, sit on external committees and make representation to the media to get architects and architecture into the news on a daily basis, then I think that many members would feel that their dollars were really going somewhere. Volunteers could then stand behind and learn from a focused, purpose driven individual or individuals who effectively would act as the public face of architecture in each state, or even nationally. Here in NSW we do have an AIA staff member who works specifically on policy issues, but with all due respect he is not an active PR type spokesperson looking for every opportunity to get in the face of the people who need to hear what architects have to say, do and offer. Unfortunately, the heavy reliance of the Institute on volunteers makes it difficult for consistent, focused advocacy and representation. Awards programs can only go so far to promote architecture, which the Institute (and Architecture Media) still haven’t come to realise and maybe never will. It’s the hard yards dealing with the key decision makers in our country that need to be done, and at the moment, we just aren’t even scratching the surface. i have other comments but that’s enough for now! Hi Warwick. Great article. The question of AIA membership is something I’ve been giving a lot of thought to lately. As a registered architect who is an employee of a large practice I am currently not a member of the AIA. I was a SONA member at university and once I entered the work force my previous three employers all provided AIA membership for me, which I took advantage of and got great benefits from. In particular I attended some excellent talks & seminars, and got a lot out of the two annual conferences I attended. I also benefited enormously from the constructive mentoring program provided to young female architects. When I took on my current role it was made clear that AIA membership would not be provided by my employer. This was the first time I had to really consider the value proposition for myself. It was something I thought very seriously about but in the end the decision was financial – I could not justify the very significant cost of membership. I intent to maintain my deep interest in and passion for the profession but I believe I can do this by attending many talks, seminars etc and purchasing ‘non member’ tickets before I come close to the cost of annual membership. Furthermore my employer is happy to purchase tickets for me to attend many of these events. Financially, membership just didn’t stack up. However I take your point about self-interest versus altruism (it sums up the issue beautifully) and I do believe in the AIA and it’s importance to the profession. I do want to support it, and I want to see it have a much higher proportion of registered architects as members. However I think there is a tipping point at which the cost is simply too great and this prevents large numbers of architects from maintaining membership. As a point of comparison, I recently became a member of the American Institute of Architects. This cost me AU$266 (factoring in a terrible exchange rate). There were several reasons for this, one being the access this provides me to specialised health architecture information (my area of speciality). The US AIA clearly have a much larger membership base and can therefore, due to economies of scale, afford to have much lower fees. However it also works in reverse – by having lower fees, they can increase the number of members they have, and therefore operate much more efficiently. I think this is something the Australian AIA should give serious consideration to (and probably already are). To sum up, I agree that the issue here is a fine balance of self-interest and altruism – and that professional altruism, and creating a strong professional body, is very important – however in my view the current weight of membership fees does not achieve the necessary balance. Thanks very much for your comment (and for reading!). I think the key thing with the membership price is value for money. If a $1,000 membership fee gave you a $2,000 discount on a new car, and you happened to be in the market for a new car, then membership would be a no-brainer. It’s easy to understand why you’re not a member – this sort of financial benefit just isn’t offered by the AIA. Without the economy of scale enjoyed by the US AIA, I get the steep price tag our AIA has to charge, I just wished the services on offer appealed more to our collective hip pockets. Great discussion of the issues. Being a self-confessed numbers-nerd, I just want to say that the registration figures you have are greater than the actual numbers because of the number of people who are registered in more than one state. For a brief moment in 2012 there was a combined list of all the registers put out by the AACA, and it listed postcodes; so it was easy (relatively) to determine whether someone was multiply-registered. I wrote about it for Parlour http://archiparlour.org/counting-registered-architects-no-easy-matter/. After double-checking I calculated that around 13% of the registered were multiples, so there were really 9,923 reg architects not 11,935 in 2012. I also had the Institute data and figured out which membership categories were for the registered and there were 5,459. So, at that time, around 55% of reg architects belonged. (I also excluded members and the registered who were listed as overseas.) It’s still not great but it’s more than half. The Amrican Institute has about the same percentage. And, of course, there was a gender split: 57% of the men and 49% of the women. Thanks for the corrections Gill, and thank you for reading! I’m chuffed you took the time 🙂 My main curiosity I think is the member saturation in other professions eg. dentists. Speaking to the ADA, my impression was that they offer a similar service to their members. Any thoughts why they have such high membership? I haven’t really looked at other professional associations, but I would imagine that it would be worth the while of the Institute to do so. One of the reasons for joining a professional associations is to access a community of like-minded people. For some architects they might get that community in the practice they work for (particularly if it’s a large one), or if they live in Melbourne or Sydney there is plenty going on without the Institute. I suspect membership levels are higher in smaller states and cities, but I would need to check that. The enduring problem of long hours are possibly also an issue for architects, with some not having the time to look any further than the project they are working on. And the cost compared to remuneration (let alone perceived value for money, as others have mentioned here) is an issue for a relatively low paid profession.